safeguard the taiga for future generations. The world's largest terrestrial biome, the taiga (pronounced /ˈtaɪgə/) is a major subarctic, geographic region of the earth's surface characterized by coniferous forests and generally long and cold winters. The Taiga is bordered on the north by the largely treeless tundra and on the south by the more temperate steppes, prairies, and hardwood forests. This ecological zone covers extensive areas of northern Eurasia and North America, and is dominated by firs, spruces, and pines, as well as species of larch, hemlock, cedar, and the non-coniferous birch and aspen. 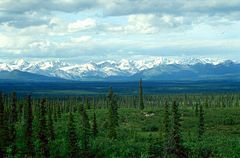 In Canada, boreal forest is the term used to refer to the southern part of this biome, while "taiga" is used to describe the more barren northern areas of the Arctic tree line. The taiga is a commonly recognized terrestrial biome. A biome, or "major life zone," is a large geographic region of the earth's surface with distinctive plant and animal communities—that is, an extensive ecosystem or grouping of ecosystems spread over a wide geographic area. However, classification of ecosystems as particular biomes is somewhat arbitrary. The taiga is considered to be an ecological zone that is south of, and more temperate than, the tundra and to be characterized mainly by the prevalence of coniferous forests. 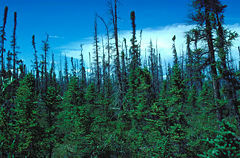 In the tundra, tree growth is hindered by low temperatures and short growing seasons, and the dominant vegetation is grasses, mosses, and lichens. The taiga is bordered on the south by the even more temperate areas of the steppes, prairies, and hardwood forests. There are coniferous forests to the south of the taiga, such as in the Pacific Northwest of North America, but these areas are classified as outside of the taiga because they have milder winters, and the taiga also is delineated on the basis of having long, cold winters, with only a short growing season. The taiga covers most of inland Alaska, Canada, Sweden, Finland, inland Norway, and Russia (especially Siberia), as well as parts of the extreme northern continental United States (Northern Minnesota, Upstate New York, New Hampshire, and Maine), northern Kazakhstan, and Japan (Hokkaidō). It is the world's largest terrestrial biome, occupying roughly an estimated one-fifth to one-third of the world's forest land. Evergreen, coniferous trees dominate the taiga, but this region also has some small-leaved deciduous trees like birch, alder, willow, and aspen; mostly in areas escaping the most extreme winter cold. However, the deciduous, coniferous larch is coping with the coldest winters on the northern hemisphere in eastern Siberia. The southernmost part of the taiga also has trees like oak, maple, and elm scattered among the conifers. Since North America, Europe, and Asia were recently connected by the Bering land bridge, a number of animal and plant species (more animals than plants) were able to colonize both continents and are distributed throughout the taiga biome. Others differ regionally, typically with each genus having several distinct species, each occupying different regions of the taiga. Taiga has a harsh continental climate with a very large temperature range between summer and winter, classified as "Dfc" or "Dfb" in the Köppen climate classification scheme. Aside from the tundra and permanent ice caps, it is the coldest biome on Earth. High latitudes mean that for much of the year the sun does not rise far above the horizon. Winters last at least 5 to 6 months, with average temperatures below freezing. Temperatures vary from −50°C to 30°C (-58°F to 86°F) throughout the whole year, with eight or more months of temperatures averaging below 10°C (50°F). The summers, while short, are generally warm and humid. In general, taiga grows to the south of the 10°C July isotherm, but occasionally as far north as the 9°C July isotherm (Arno and Hammerly 1984; Arno et al. 1995). The southern limit is more variable, depending on rainfall; taiga may be replaced by open steppe woodland south of the 15°C July isotherm where rainfall is very low, but more typically extends south to the 18°C July isotherm, and locally where rainfall is higher (notably in eastern Siberia and adjacent northern Manchuria) south to the 20°C July isotherm. In these warmer areas, the taiga has higher species diversity with more warmth-adapted species such as Korean pine, jezo spruce and Manchurian fir, and merges gradually into mixed temperate forest, or more locally (on the Pacific Ocean coasts of North America and Asia) into coniferous temperate rainforests. The taiga experiences relatively low precipitation throughout the year (200–750 mm annually), primarily as rain during the summer months, but also as fog and snow. As evaporation is also low for most of the year, precipitation exceeds evaporation and is sufficient for the dense vegetation growth. Snow may remain on the ground for as long as nine months in the northernmost extensions of the taiga ecozone (Sayre 1994). Taiga soil tends to be young and nutrient-poor; it lacks the deep, organically-enriched profile present in temperate deciduous forests (Sayre 1994). The thinness of the soil is due largely to the cold, which hinders the development of soil and the ease with which plants can use its nutrients (Sayre 1994). Decomposition of plant litter is limited by lack of larger, decomposing invertebrates. Fallen leaves and moss can remain on the forest floor for a long time in the cool, moist climate, which limits their organic contribution to the soil; acids from evergreen needles further leach the soil, creating spodosol (Sayre 1994). 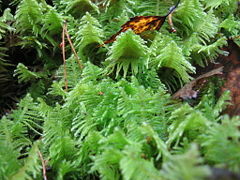 Since the soil is acidic due to the falling pine needles, the forest floor has only lichens and some mosses growing on it. It is not good for farming because it is nutrient poor. There are two major types of taiga, closed forest, consisting of many closely-spaced trees with mossy ground cover, and lichen woodland, with trees that are farther-spaced and lichen ground cover; the latter is more common in the northernmost taiga (Sayre 1994). The forests of the taiga are largely coniferous, dominated by larch, spruce, fir, and pine. Evergreen species in the taiga (spruce, fir, and pine) have a number of adaptations specifically for survival in harsh taiga winters, though larch, the most cold-tolerant of all trees, is deciduous. Taiga trees tend to have shallow roots to take advantage of the thin soils, while many of them seasonally alter their biochemistry to make them more resistant to freezing, called "hardening" (Sayre 1994). The narrow conical shape of northern conifers, and their downward-drooping limbs, also help them shed snow (Sayre 1994). Although the taiga is dominated by coniferous forests, some broadleaf trees also occur, notably birch, aspen, willow, and rowan. Many smaller herbaceous plants grow closer to the ground. Periodic stand-replacing wildfires (with return times of between 20-200 years) clear out the tree canopies, allowing sunlight to invigorate new growth on the forest floor. For some species, wildfires are a necessary part of the life cycle in the taiga; some, for example, jack pine have cones that only open to release their seed after a fire, dispersing their seeds onto the newly cleared ground. Grasses grow wherever a patch of ground receives sunlight, and mosses and lichens thrive on the damp ground and on the sides of tree trunks. In comparison with other biomes, however, the taiga has a low biological diversity. Coniferous trees are the dominant plants of the taiga biome. A very few species in four main genera are found: The evergreen spruce, fir, and pine, and the deciduous larch or tamarack. In North America, one or two species of fir and one or two species of spruce are dominant. Across Scandanavia and western Russia, the Scots pine is a common component of the taiga. The taiga is home to a number of large herbivorous mammals and smaller rodents. These animals have also adapted to survive the harsh climate. Some of the larger mammals, such as bears, eat during the summer in order to gain weight and then go into hibernation during the winter. Other animals have layers of fur or feathers to insulate them from the cold. The elk (or wapiti, Cervus canadensis), moose (Alces alces), wolf (Canis lupus), fox, and sable (Martes zibellina) populate the taiga. 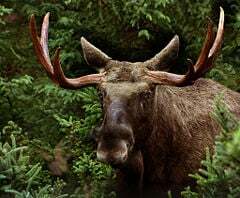 A number of wildlife species threatened or endangered with extinction can be found in the Canadian Boreal forest, including woodland caribou, grizzly bear, and wolverine. Habitat loss due to destructive development, mostly in the form of logging, is the main cause of decline for these species. Due to the climate, carnivorous diets are an inefficient means of obtaining energy; energy is limited, and most energy is lost between trophic levels. However, predatory birds (owls and eagles) and other smaller carnivores, including foxes and weasels, feed on the rodents. Larger carnivores, such as lynxes and wolves, prey on the larger animals. Omnivores, such as bears and raccoons are fairly common, sometimes picking through human garbage. A considerable number of birds such as Siberian Thrush, White-throated Sparrow, and Black-throated Green Warbler, migrate to this habitat to take advantage of the long summer days and abundance of insects found around the numerous bogs and lakes. Of the perhaps 300 species of birds that summer in the taiga, only 30 stay for the winter (Sayre 1994). These are either carrion-feeding or large raptors that can take live mammal prey, including golden eagle, rough-legged buzzard, and raven, or else seed-eating birds, including several species of grouse and crossbills. In Canada, less than 8 percent of the boreal forest is protected from development and more than 50 percent has been allocated to logging companies for cutting (GRWC 2000). The main form of forestry in the boreal forest in Canada is clearcutting, where most if not all trees are removed from an area of forest. Clearcut upwards of 110 km² have been recorded in the Canadian boreal forest. Some of the products from logged boreal forests include toilet paper, copy paper, newsprint, and lumber. However, in most cases, forest companies harvest trees to create high value products used for building and value added processing. Pulp is produced by using tree tops, low grade trees, and species that cannot be used for other products. More than 80 percent of boreal forest products from Canada are exported for consumption and processing in the United States. Most companies that harvest in Canadian forests are certified by an independent third party agency such as the Forest Stewardship Council (FSC), Sustainable Forests Initiative (SFI), or the Canadian Standards Association (CSA). While the certification process differs between these, all of the various groups include requirements related to forest stewardship, respect for aboriginal peoples, compliance with local, provincial and/or national environmental laws, forest worker safety, education and training, and other environmental, business and social requirements. The prompt renewal of all harvest sites by planting or natural renewal is also required. Recent years have seen outbreaks of insect pests in forest-destroying plagues: The spruce-bark beetle (Dendroctonus rufipennis) in the Yukon Territory, Canada, and Alaska (Seiferling and Vetter 2003); the aspen-leaf miner; the larch sawfly; the spruce budworm (Choristoneura fumiferana); and the spruce coneworm (Chapin et al. 2006). Arno, S.F., and R.P. Hammerly. 1984. Timberline. Mountain and Arctic Forest Frontiers. Seattle: The Mountaineers. ISBN 0898860857. Arno, S.F., J. Worral, and C.E. Carlson. 1995. Larix lyallii: Colonist of tree line and talus sites. In W. C. Schmidt and K. J. McDonald, (eds. ), Ecology and Management of Larix Forests: A Look Ahead. USDA Forest Service General Technical Report GTR-INT-319. Chapin, F. S., M. W. Oswood, K. Van Cleve, L. A. Viereck, and D. L. Verbyla. 2006. Alaska's Changing Boreal Forest. Oxford University Press. ISBN 1423761561. Global Forest Watch Canada (GFWC). 2000. Canada’s Forests At A Crossroads: An Assessment in the Year 2000. World Resources Institute. Retrieved April 21, 2008. Natural Resources Canada (NRC). 2007. Spruce budworm and sustainable management of the boreal forest. Canadian Forest Service. Retrieved April 21, 2008. Sayre, A. P. 1994. Taiga. New York: Twenty-First Century Books. ISBN 0805028307. Seiferling, I. S., and M. Vetter. 2003. A new method to reconstruct bark beetle outbreaks. 34th Annual International Arctic Workshop 2004. Retrieved April 21, 2008. Arctic and Taiga (Canadian Geographic). Index of Boreal Forests/Taiga ecoregions at bioimages.vanderbilt.edu. This page was last modified on 11 November 2015, at 16:31.